What was there in President Rouhani’s address to the World Economic Forum’s Annual Meeting for Netanyahu to see if he was of sound mind? His main message to the world, and probably President Obama in particular, was this. His message on nuclear matters was unambiguous. So as Netanyahu says he sees it, Iran is hell bent on developing nuclear weapons for the purpose of wiping the Zionist (not Jewish) state off the face of the earth. As I have pointed out in the past, the real madness of Netanyahu’s assertion is that even if Iran did posses a few nuclear bombs and the missiles to deliver them, it would not launch a first strike on Israel because to do so would guarantee its own complete destruction. All Iranians know that. IF Netanyahu was of sound mind he would not only have given Rouhani’s Davos speech the consideration it deserved, he would take full account of Israel’s growing isolation in the world and, also, the fact that an increasing number of American Jews are no longer sympathetic to what one Jewish-American has called “the blood-and-soil nationalism of Zionism”. The conclusion such introspection would invite in a sound Netanyahu mind is that if he doesn’t want to go down in history as the leader who approved Israel’s suicide plan and confirmed that Zionism is (as the title of my book asserts) the real enemy of the Jews, he had better be serious about peace on terms the vast majority of Palestinians could accept. Though I am not an expert on the subject, it seems to me that what Netanyahu needs most of all is some psychiatric help. President Obama recently said in an interview with the New Yorker that the chances of getting a real Israel-Palestine peace process going were “less than 50-50“. Perhaps he should take Secretary of State Kerry off the case a put a leading psychiatrist on it. He and his de facto Israeli agents (the scores of neoconZionists in Congress and within at least a dozen primary Washington Think Tanks who are trotted out regularly on Zionist-controlled media as "experts on Middle East policy"; those who write US wars for Israel) will do whatever it takes to get their plan back on track. Netanyahu, I think, is most definitely insane, a psychopath without conscience, just as some of those who illicitly founded Israel by massacres and other acts of terror were psychopaths without conscience. But its fitting that he represents Israel, what Finkelstein rightfully calls a lunatic state. It seems to me that events in 1947/48, when Israel was officially created and recognised (and where the UN plan involved giving ~40% of Palestine to the Palestinians), would supersede anything that might have happened 25 years earlier, but I don't know the details of it all. 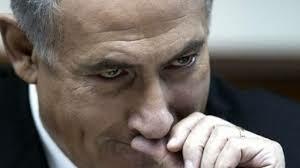 Netanyahu is an excellent con-man. His obsession with Iran is to divert world's attention from Israel's Zionazi policies against native Muslim and Christian Palestinians. "To understand Netanyahu’s posture one needs to realize that it is not only, or maybe even primarily, about a possible Iranian nuclear weapon. It is partly a matter of heading off any rapprochement between Iran and the United States, which would weaken the Israeli claim to being America’s sole reliable and important partner in the Middle East. It is partly a matter of sustaining the Iranian nuclear issue as the regularly invoked “real problem” in the region that serves to divert attention from matters the Israeli government would rather not talk about or be the subject of international scrutiny. And it is partly a matter of Netanyahu riding a topic he has made a signature issue of his own in Israeli domestic politics and a basis for his claim to tough-guy leadership," says Paul R. Pillar, former CIA official for 28 years. I Take All you say to heart [ Alan Hart ]..And That is Because YOU make A Point of Always Speaking The Truth...Wherever It Leads you. As for b.Netty being Certifiable...YES, HE IS. In every Possible Manner, he is Certifiable. Deluded ? I Think Not. What He is all about..is Trying to Delude All Others to Think as HE thinks ( Or do no thinking at All ! } Some Folks you can trust Most of the Time. Some,Always. Then there is b.Netty. HE Is the most vicious natured individual that Lives. When the world is rid of him..it can go back to being A Better World ..in Every Sense. HE IS one who Thrives on Bloodshed, Strife and Making Trouble Wherever he can get a Toe-hold long enough to dig in. Beware..All of YOU who Aren`t Yet pursuaded of This Truth. Look deep in his eyes ..if you ever Get that opportunity, that is ! And YOU will See Only Satan in there. And THIS Misled country is even yet Being taken for suckers ?? Now Alan We all know that Bibi allways speak the truth. Ask any member of congress. As a McDonald*s register worker or a Monsanto lobbyist is assigned to sell bad health to the public at a profit, Nuttyyayhoo is assigned to sell Israel to the world as the Will of God and the paramount of God*s virtue. Of course this has proven to be an impossible task, so The City of London must use its media control over the U.S. to manage elections in America and get traitors and pigs elected in America to arrange murder for the benefit of The City of London, Israel*s boss. If Nuttyyayhoo was not insane before he became the leader of Israel, his impossible task has turned him into a psychopath at best or a pig at worst. So much pain and suffering to feed The City of London is evil. I'd like someone to ask Netanyahu one simple question: just what would you expect from Iran, in order to lead to a genuine peace negotiation? It seems to me that whatever the Iranians offer, the answer will be, "Oh, they are just deceiving us. They don't mean that! You can't trust them." You can't win against that kind of attitude; just as, when you are involved in a long dispute about some matter, your opponent will not accept the facts that you use, implying, or actually stating, that you are deluded or even a liar: an experience I've often had wasting my time arguing with some Zionists. Several times I've quoted Ilan Pappe and been told he is 'totally discredited', which, of course, he has not, or, for example, that Alan Hart is a 'well-known anti-Semite', for which, of course, there is no evidence whatsoever! Funny analysis, but right on. Only if the mass media in the US didn't control public opinion, they could see through the BS they are fed by Netanyahu and biased reporting.